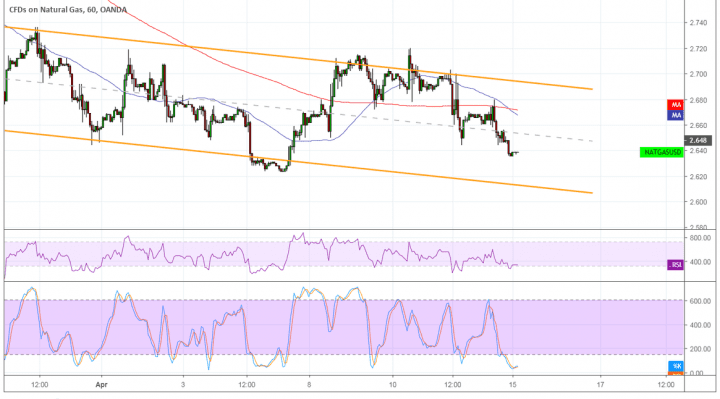 Natural gas is resuming its slide as it completed a short-term pullback and is setting its sights on a new channel bottom. Technical indicators are giving mixed signals, though. The 100 SMA has just crossed below the longer-term 200 SMA to indicate that the path of least resistance is to the downside. This means that the selloff is more likely to gain traction from here. Price has also fallen below the mid-channel area of interest to confirm that bearish momentum is picking up. This could take price back to the channel bottom around $2.600 that lines up with a long-term floor. If support holds, another pullback to the channel top might follow. RSI is already turning higher after recently dipping into the oversold region. A bit of bullish divergence is also seen as the oscillator made higher lows while price had lower lows. Stochastic is also in the oversold territory but has yet to pull up to indicate a return in bullish momentum. If it does, price might still bounce back to the channel top around $2.650. Analysts are giving mixed signals for natural gas prices as demand could stay afloat on account of slightly cooler weather conditions than predicted. Still, there is the looming decline on spring coming up while supply remains elevated. Last week, the EIA reported a storage build of 25 Bcf for the week ending April 5 versus the consensus average of a 29 Bcf build. For the week ending April 12, there could be a storage build of 80 Bcf. More pipelines being opened could have a mixed impact on overall prices as this could mean more usage of output instead of being piled up. However this could also encourage oversupply, which is a likely factor in the months ahead. Bear in mind that the likes of China and Saudi Arabia are looking to profit from this market as well, which could mean increased supply on their end.